This article is about the historic mill in Portland, Oregon. For the historic mill in Tacoma, Washington, see Albers Brothers Mill. West elevation of the Albers Brothers Milling Company building in 2008. On the right is the Broadway Bridge. Map of location in Portland. The Albers Brothers Milling Company building is a historic mill and contemporary office building located on the banks of the Willamette River in Portland, Oregon, United States. In the early decades of the 20th century, the German-immigrant Albers brothers built the largest flour and feed milling enterprise on the West Coast, headquartered in Portland and comprising operations in four states. This combined milling, warehousing, shipping, and office facility, built in 1909–1911, is the oldest remaining flour or feed mill in the city. The silos built into the south elevation of the building are painted with representations some of the mill's products as advertisements. The building was listed on the National Register of Historic Places in 1984. It was unoccupied at that time, as the milling company had already left. It was converted into an office building in 1989. Albers was also well known in the San Francisco Bay Area for its prominent grain elevator and neon sign located at the foot of the ferry pier ("mole") of the Southern Pacific in Oakland, now the site of the Port of Oakland container ship facilities. 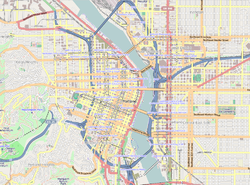 ^ Portland Historic Landmarks Commission (July 2014), Historic Landmarks -- Portland, Oregon (XLS), retrieved October 19, 2015 . ^ a b c d e Heritage Investment Corporation (October 18, 1984), National Register of Historic Places Inventory — Nomination Form: Albers Brothers Milling Company (PDF), retrieved February 24, 2016 . ^ a b Oregon Parks and Recreation Department, Oregon Historic Sites Database, retrieved September 24, 2013 . ^ Norman, James B., Jr. (1991), Portland's Architectural Heritage: National Register Properties of the Portland Metropolitan Area (revised 2nd ed. ), Portland: Oregon Historical Society Press, ISBN 0-87595-241-0, OCLC 25072863 . ^ "Site Summary Report - Details for Site ID 4590, Albers Mill Property". Environmental Cleanup Site Information (ECSI) Database. Oregon Department of Environmental Quality. Retrieved September 25, 2013. This article about a property in Oregon on the National Register of Historic Places is a stub. You can help Wikipedia by expanding it. This page was last edited on 11 November 2017, at 04:00 (UTC).